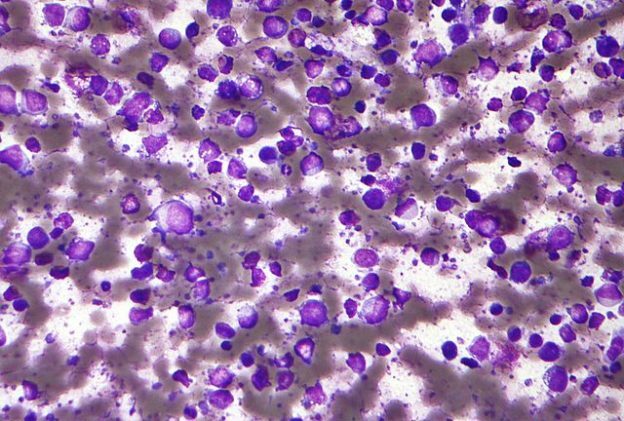 The diffuse large B-cell lymphoma (DLBCL) is the most common type of non-Hodgkin’s lymphoma (NHL). It is an aggressive, rapid-growing type of NHL that is rapidly fatal if untreated. DLBCL is the most common type of NHL in the United States, accounting for 25 % to 35 % of all NHLs. The incidence rate of DLBCL is approximately 4.7 cases per 100,000 persons annually in the US, and it is constantly increasing. The incidence increases with age and the mean age at the time of diagnosis is 64 years. Men are slightly more susceptible. The World Health Organization (WHO) has classified DLBCL into following different sub-types depending upon specific clinical, morphologic and molecular characteristics. The clinical presentation of patients with DLBCL is very similar to other NHLs or other types of blood cancer. Most cases are accompanied by painless enlarged and swollen lymph nodes. Moreover, over 40 % of the patients have the extranodal manifestation of the disease, namely, skin, gastrointestinal tract, central nervous system, respiratory system, genitourinary tract, or the bones. The cancerous cells typically target the reticuloendothelial system (lymph nodes, spleen, liver and bone marrow); hence the common physical findings are lymphadenopathy (often involving cervical, axillary and inguinal lymph nodes) and hepatosplenomegaly. Histological examination: The microscopic examination of the excisional biopsy of the nodes is the gold standard for the diagnosis. It shows a diffuse spread of abnormally enlarged cells with an equal number of small and large cells, with a cleaved or indented nucleus and coarse chromatin in them. Bilateral iliac crest bone marrow biopsies (staging) determines the rate of the bone marrow involvement. Lumbar puncture in advanced cases (cytologic and chemical analysis of the cerebrospinal fluid). CT scan of neck, chest, abdome, and pelvis to know the extent of the disease and aids in the staging of DLBCL. Positron emission tomography (PET) in higher grades of the malignant process. Bone imaging and bone marrow biopsy are needed if there is a history of unexplained bone pain, elevated alkaline phosphatase levels and/or pancytopenia. The staging of DLBCL is done, like other NHLs, by the Ann-Arbor classification. Table: “DLBCL Ann Arbor staging” by biooncology.com. Chemotherapy: The most common chemotherapy regimen for advanced DLBCL is called R-CHOP. R-CHOP includes Rituximab, Cyclophosphamide, Hydroxydaunorubicin (doxorubicin), Oncovin (vincristine) and Prednisone. Chemotherapy coupled with stem cell transplantation (autologous or allogeneic) in the case of relapse of the disease. The NHL international prognostic index is used to predict the prognosis of patients with DLBCL. It consists of the following five risk factors. 1. A 67 year-old-man, plumber complains of multiple swellings in the neck, easy fatigability and bone pain at rest. On exam, his temperature is 38.9°C and he is sweaty and weak. CBC reveals a low hemoglobin and platelet count. Serum biochemistry reveals hypercalcemia. The biopsy report of the neck node is given: There are equal numbers of big and small cells mixture which have coarse chromatin in the cleaved nucleus. What is the most probable diagnosis? Fast growing and ruthless if there is no timely treatment neoplasm, triggered by cancerous B-lymphocytes, NHL. 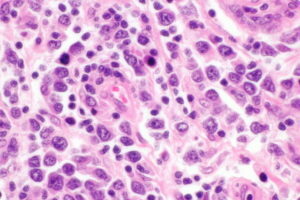 Slow growing regardless treatment neoplasm, triggered by cancerous lymphocytes, NHL. Moderately growing on the background of proper chemotherapy neoplasm, triggered by cancerous B-lymphocytes NHL. Fast growing regardless treatment neoplasm, triggered by T-lymphocytes. 3. What are the most informative methods of diagnostics of DLBCL? CBC, Flow cytometry, calcium in blood serum, LDH, serum β2 microglobulin (B-cell lymphoma) testing biopsy of the affected node or the organ tissue, CT.
CBC, Potassium and folate in the blood serum, serum β2 microglobulin (B-cell lymphoma) testing CT, kidney tests and X-ray. CBC, Calcium in the blood serum, CT (bone scan), ECG, urine examination, serum β2 microglobulin (B-cell lymphoma) testing. CBC, Cholesterol, serum β2 microglobulin (B-cell lymphoma) testing, X-ray, ECG, flow cytometry, potassium in the blood serum.